Today I wanted to do a light post about my recent haul. I have to say it does feel good to have placed a few online orders for makeup and pretty things. Granted I am a materialistic person who maybe likes makeup too much, but it also means my work schedule is finally letting me breathe and think like a beauty blogger (yay!). I've realized I don't shop or even think about shopping much when I am really busy, which is interesting because I know retail therapy can be quite soothing for many people under stress. For me, shopping based on "want" (vs "need") is some form of creativity, which I do not think I could afford lately. I've ordered from ASOS and Beauty.com taking advantage of good sales. Both carry Paul & Joe stuff, and it was quite fun to compare price and add things to the shopping baskets sensibly. My observation is that Beauty.com offers Paul & Joe Beaute priced very reasonably and their selections are pretty much up-to-date. Overall price on ASOS is higher, but I can spot some amazing deals there. 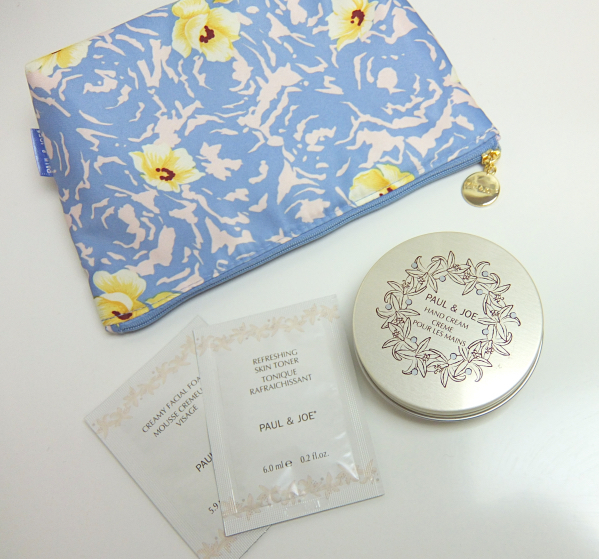 This hand cream / makeup pouch set is ASOS exclusive and on sale at around $15. I am interested very little in the skincare samples and certainly don't need another hand cream, but I'd totally pay more than $15 just for the makeup pouch. It is beautifully made with high quality fabric and a perfect size. The hand cream isn't half bad, actually. It is delicately scented with a feminine floral and feels light yet moisturizing. But I adore the tin more than what's inside. It is big to carry around (80g), so it's been placed on my nightstand. The Pressed powder duo refil was also on sale at a little more than $20, which is much cheaper than the price on beauty.com. I chose the Cool shade, which is a very pretty and pale ivory with highlighting shimmer. This will be housed in the empty Paul & Joe compact that I've had for years. The sheer lipstick refil (Pink Balloon) was purchased from ASOS, and the lipstick tube from beauty.com since it was cheaper even at the regular price offered there. And, taking advantage of $10 off coupon at beauty.com, I bought the new NARS foundation! I have yet to try this but so far I think I like how it looks. The light yellow based Gobi shade is quite ideal for my skin. We will soon find out if it indeed is "luminous, weightless and lasting all day"! Have you spotted any good deals lately? What pretty things have you been eyeing on? Oh you definitely scored some good deals , Lena! I am assuming this NARS blush is very much like those liquidy silicon-y foundations introduced lately but in a creamier consistency. It wouldn't work very well on dry skin, is my hunch. We will see. I will make sure to test it out soon and form a proper review! The NARS foundation!! Can't wait to read your review, Lena! I haven't tried anything from Paul & Joe but I've always admired their packaging - it's so adorable! Very excited to hear your thoughts on the foundation, I've heard both good and bad things! i always love the design and packing of the paul and joe items. you got some great picks here and the duo powder looks very pretty. awesome that you could put it into an empty compact that you already had. i've only ever tried their blush product and it was a huge favourite for me last winter. I'm quite happy with my haul. They were all delivered in timily manner, too! Ahh! What a wonderful haul! I've always wanted to try a base from P&J but mostly I've been lusting after their blush duos! I can't wait to see you review on the powder and that foundation from nars! Hope they are all great! I think you'd like the P & J makeup. Especially blushes, since they do very well on pressed powder anything. 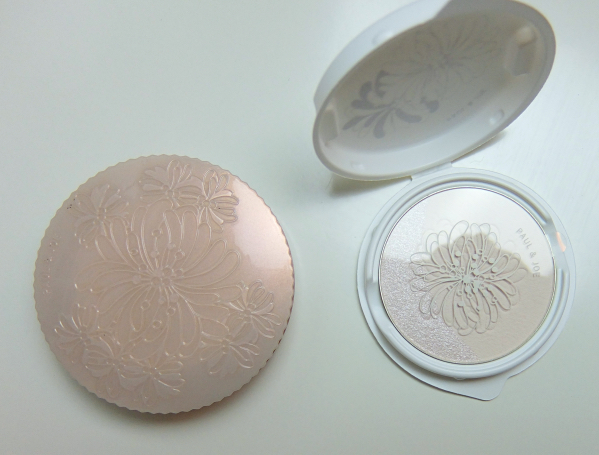 I've used the pressed powder before and I love it - kind of a repurchase. Nice haul! That lipstick is gorgeous! I'd love to try the foundation, but I fear that it'll accentuate dry patches. I want to get a sample for sure though! Can hardly wait to hear your thoughts. Lipstick queen had (and still has?) sales on their lipstick sets so I grabbed one of those introductory set with three lipsticks for 24 bucks (still had to pay shipping and tax). Then last week when I was in the city, I spotted a bunch of Gosh cosmetic on clearance at Penn Station,so I hoarded a bunch of crap as well (when I was supposed to look for shoe polish). P & J packaging is my thing. For example, Jill Stuart is too cute and frilly, but P & J is just right, you know? Albion makes them, so quality is nice overall. Many people say it is like the Chanel perfection lumiere in many ways. I'm curious to find out myself. I just discovered Lena's blog as well thanks to you, Gyudy, and stalking your comment section, lol. :-) I'm curious about the NARS foundation as well, though I generally prefer fuller coverage. Thanks for stopping by and leaving me a comment! 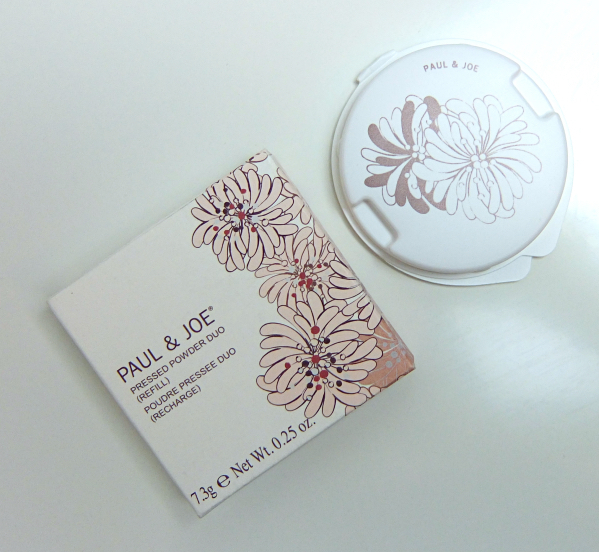 I have always loved how cute the packaging Paul & Joe is. I have only tried their lip glosses before. 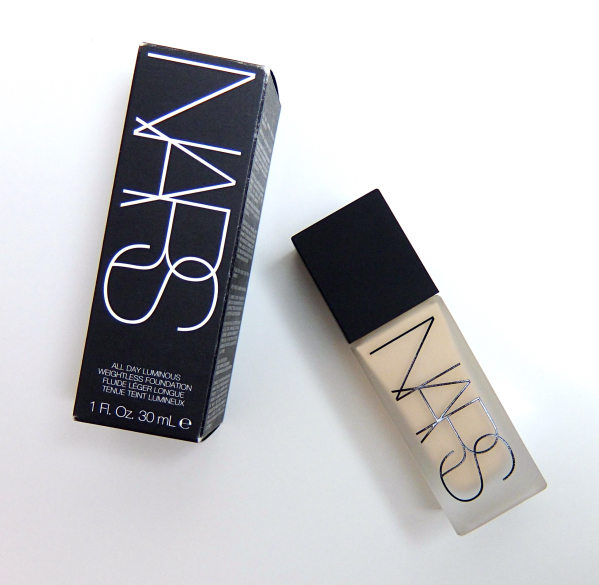 Can't wait to hear what you think of the Nars foundation. Wonder if it is remotely similar to Chanel Aqua Vitalumiere. To be absolutely honest, Paul & Joe makeup itself is overall is betweent B+ and A-. Very solid and nothing really disappoints, but it is the packaging that makes everything so much better. LOL. I hear their liquid lip color is quite good, so I want to get it next time. Hey Lena! I havent tried ANY of these but that lipstick in particular is calling out my name!! (sort of a )good thing that I cant buy Paul& Joe anywhere close to me here in Montreal heh. I read your other post about the makeup addict tag. If I could get my vanity to look ANYTHINGlike it does in your picture i will be SOOOO happy. I dont know why i keep putting off clearing my stuff out ugh. Such a savvy shopper! :D Paul & Joe products are always so cute. 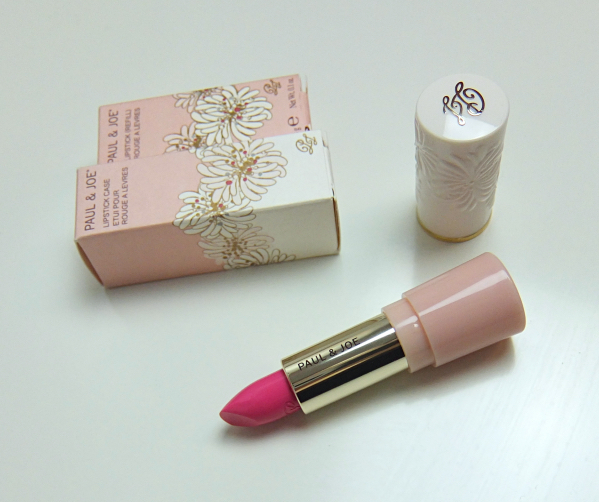 The lipstick looks like a gorgeous shade - nice and cheerful. I think that NARS foundation is not going to suit my dry skin with all my unattractive dry patches, but I hope it works out for you! The finish does look beautiful in most of the reviews that I've read so far! ;D I' quite happy with this haul! ASOS order arrived fairly quickly as well. I am going to try the foundation at least for a week before I make my conclusion. I really hope it works for me. It's my first full-bottle foundation purchase from NARS! I only one Paul & Joe lipstick! I always adore their packaging, though! I don't think I've tried hand creams in a tin packaging before. Neat concept! Looking forward to your review on the NARS foundie! I've only tried their sheer lipstick formula so far. I'm interested in the liquid lip color, though. They are all solid if not groundbreaking, imho. And of course, the packaging makes them even better! Can't wait for your thoughts on this foundation!